Peanut Butter Cup Oreo Fudge is a simple dessert you can make in your microwave. This fudge recipe is much quicker and easier than old fashioned fudge and is sure to delight the peanut butter lovers in your life. I started by spraying a square cake pan with Pam Spray For Baking . I use this cooking spray for pretty much everything because I find it way less greasy than other sprays and also very effective. I then placed peanut butter cups in the bottom of the pan and sprinkled mini Oreo cookies over top. I dumped some chocolate frosting and milk chocolate bars into a microwave safe bowl. They were microwaved on high for a minute and a half and then stirred until the chocolate was completely melted. 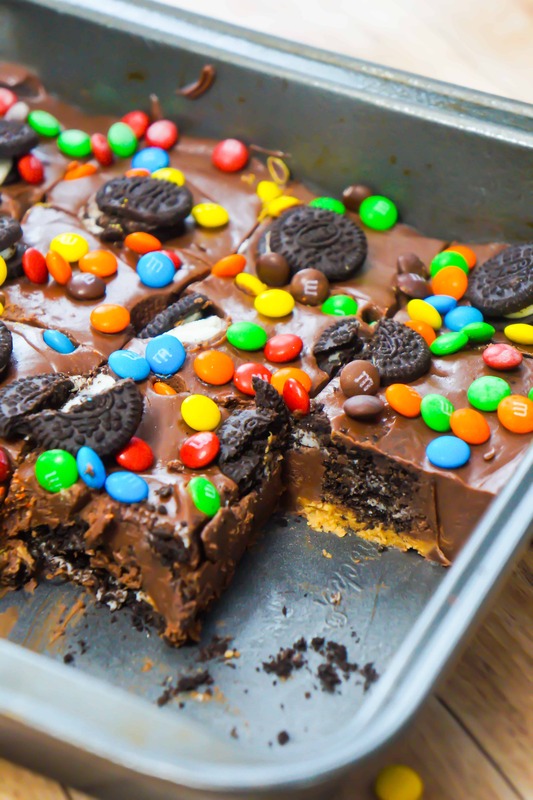 The chocolate mixture was poured over the peanut butter cups and Oreos in the square pan. I spread the mixture out evenly with a spatula being sure to cover all the peanut butter cups and cookies. More mini Oreos were sprinkled on top along with some mini M&Ms. The fudge was refrigerated for about an hour before slicing and serving. This chocolate fudge recipe features the delicious combination of peanut butter and Oreos. Peanut butter cups are one of my favourite treats and combining them with Oreos makes them even better. This is the perfect dessert recipe for when you are short on time but still want to produce an impressive decadent treat. 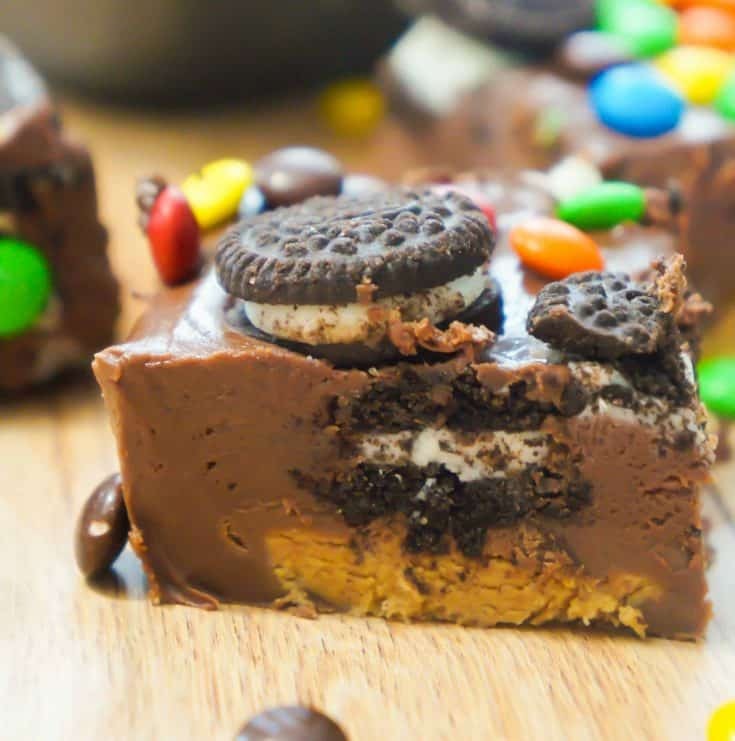 Serve this Peanut Butter Cup Oreo Fudge at your next party or gathering. If you are looking for more chocolate peanut butter dessert recipes check out Peanut Butter Ritz Cracker Toffee, Chocolate Peanut Butter Cheesecake Dip, Peanut Butter Rice Krispie Treats and Peanut Butter Cookie S’Mores Cups. 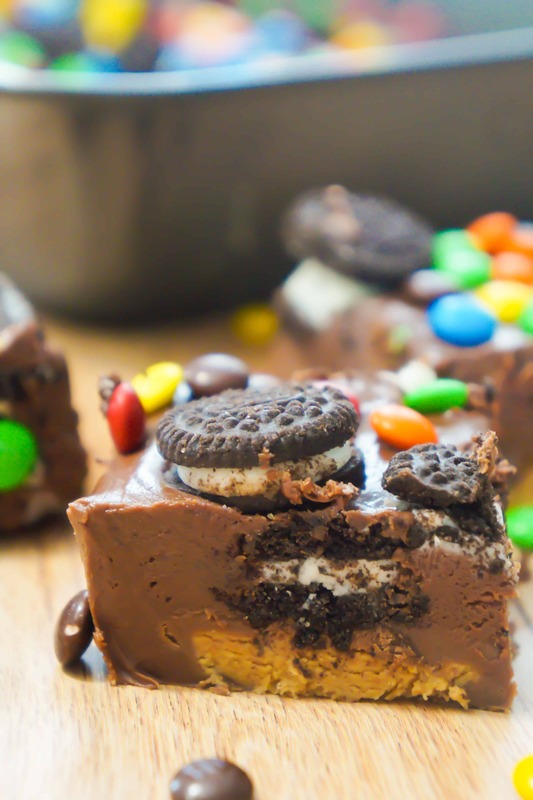 Easy chocolate fudge recipe loaded with Oreos, peanut butter cups and M&Ms. Grease an 8 inch square cake pan with Pam for Baking. Place the peanut butter cups in the pan evenly spaced out. Sprinkle the mini Oreos over the peanut butter cups. Dump the frosting and the milk chocolate into a microwave safe bowl. Microwave on high for a minute and a half. Stir until completely melted. If the chocolate is not completely melted return to microwave for 30 seconds. Pour chocolate mixture into square pan and spread evenly being sure to cover all of the peanut butter cups and Oreos. 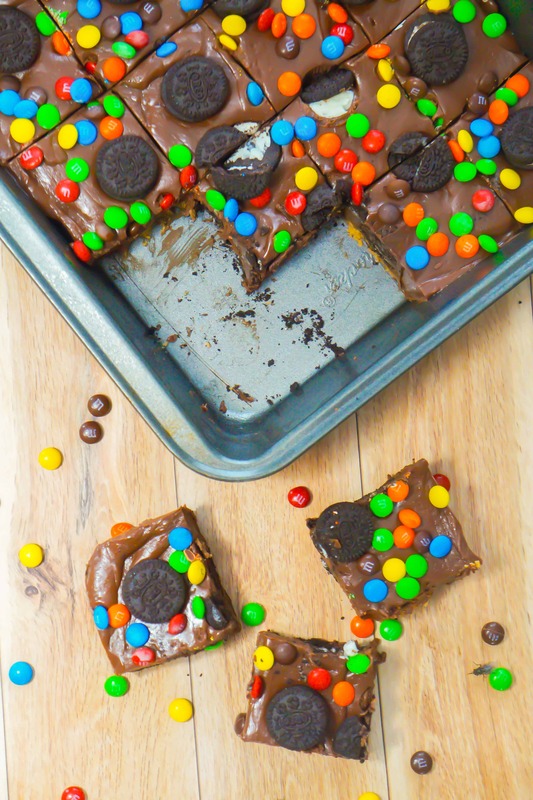 Sprinkle mini Oreos and mini M&Ms on top. Refrigerate for at least an hour before slicing and serving.